I've seen Peter Pan collars on dresses, coats, shirts, t-shirt, tunics and even as stand alone collars to add a little bit of something extra to a outfit. They add a bit of instant style to what could have been a really boring outfit.! They have this irresistible geek chic that I cant help but be drawn too! I think they are a totally interchangeable season piece, as they look adorable on summer dresses and shirt ones can be worn in the winter layered up with cardigans! 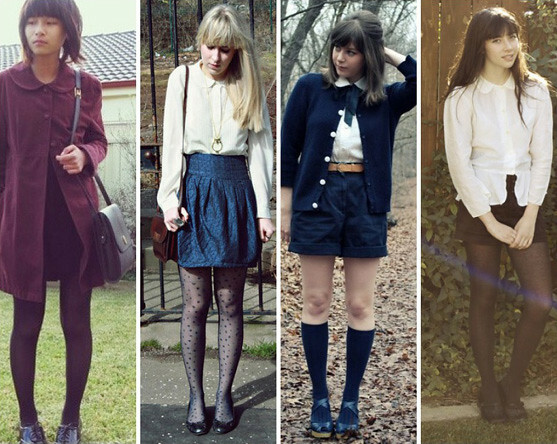 Maria & Annabel's looks are possibly my favourite ways to embrace a Peter Pan collar. The whole librarian/secretary/school girl look looks really cool. I love the way they have the tied ribbon in the middle of their shirts! That is something I'd defiantly like to try at some point! I adore the pastel yellow shirt on Mitzi Coco. Paired with those highwaisted shorts and brogues its a perfect summer look! I'm going trawling over Etsy for a detachable Peter Pan Collar! I've been on the hunt for a Peter Pan collared dress for a while now, and I recently bought three dresses from Topshop with all with adorable peter pan collars! I cant wait to show you when Im back from holiday! I've got three different colours too, so Ill be doing a Keep or Return asking which is the best colour for me! I love the dresses by in typical Topshop style they are ridiculously see through so I need to buy a slip, and I cant decide which colour to keep, So I think I'll do a keep or return on it soon! I really need a white peter pan collared shirt in my wardrobe too! Which look do you like the best? Are you a fan of Peter Pan Collars? Let me know in the comments! Also leave me links to you wearing a peter pan collars, your picks of peter pan collars or even someone else who you think really works the peter pan collar! Yes, yes, a thousand times yes! Peter pan collars are the way forward - I've been thinking of making a standalone one for a while and having seen these ladies rocking it I most certainly will! I have been a long time fan of the Peter Pan collar! I have a detachable one that looks so cute over a whole bunch of stuff, as well as loads on dresses and coats and things anyway. it's a trend i want to try! maria and annabel are definatly my favourite one. i just cannot get enough of thier blogs. Aaaw I love the peter pan-ness! This is strange actually because the last outfit post I did I had one too :) I love it even more so when it's on a coat lapel (sp?!) thanks for sharing these love! my favourite coat has a peter pan collar on it, it's so cute!